Added by kou (Kouhei Sutou) over 2 years ago. Updated over 2 years ago. GC cares memory allocated by only Ruby. GC doesn't care memory allocated by external library. GC isn't run frequently when external library allocates large memory but Ruby allocates only small memory. In the case, process uses large memory. e.g. : Programs that handle large images may use large memory even when most images are garbage. How about improving GC to care memory allocated by external library? It means that GC is run when external library allocates large memory. The gem provides an API that accepts diff of memory usage of external library. Bindings of external library notify diff of memory usage of external library. 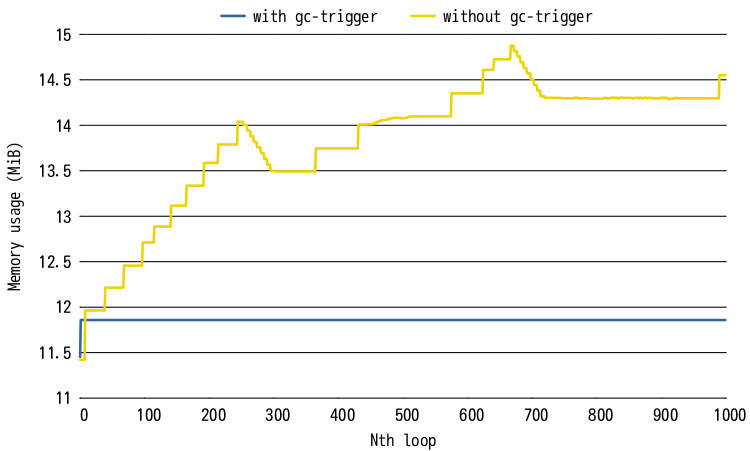 GC is run when total memory usage of external library overs threshold. Then memory of external library associated with garbage Ruby objects is freed. I tried the concept with rcairo that is bindings of cairo 2D graphics library. Memory usage is increased without the concept but stable with the concept. * \returns the adjusted value. LGTM. Iff Koichi agrees, it should be merged. I don't see this ticket details yet but implementing the concept is OK to me.